The plant is dedicated to the welfare of tribals and farmers in the State, he said. 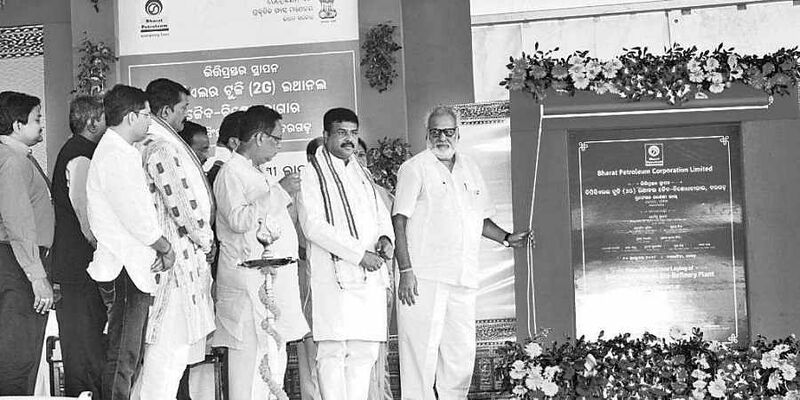 BARGARH : Governor Prof Ganeshi Lal laid the foundation stone for the second generation (2G) ethanol Bio-Refinery of Bharat Petroleum Corporation Limited (BPCL) in presence of Union Petroleum and Natural Gas Minister Dharmendra Pradhan here on Wednesday. The Bio-Refinery will come up at Baulasingha under Bhatli tehsil of the district. Speaking on the occasion, the Governor said the Bio-Refinery will play a pivotal role in changing the socio-economic condition of the area. The plant is dedicated to the welfare of tribals and farmers in the State, he said. In his address, Pradhan said the Bio-Refinery will be one among 12 such projects in the country. “It is a Nuakhai Bheti (gift) from Prime Minister Narendra Modi to people of Bargarh,” he said. Bargarh, known as the rice bowl of Odisha, produces around 17 lakh tonne of paddy annually. Moreover, about 15 lakh tonne of paddy straw is generated in the district every year. “BPCL will procure paddy straw from farmers to utilise it for production of ethanol from the Baulasingha Bio-Refinery,” Pradhan said. The project will also create about 1,200 direct and indirect jobs in the district, Pradhan said. The country spends around `5 lakh crore annually to import crude oil. Blending of ethanol will help reduce crude oil import, the Union Minister said and added that there is scope for setting up of five more such refineries in the district. The Baulasingha Bio-Refinery, which will be set up at an estimated cost of `1,000 crore, will have the capacity to produce three crore litres of fuel grade ethanol annually by using paddy straw as feedstock. The ethanol produced from the plant will be blended with petrol. The plant will utilise around two lakh tonne of paddy straw annually as feedstock. The straw will be procured from nearby places including Bhatli, Ambabhona, Attabira, Sohela, Burla and Lakhanpur. Among others, Steel, Mines and Works Minister Prafulla Kumar Mallik, Handlooms, Textiles and Handicrafts Minister Snehangini Chhuria, Rajya Sabha Member Prasanna Acharya and Bargarh Lok Sabha Member Prabhas Kumar Singh were present. Prof Lal interacts with PRI members Rourkela: Governor Prof Ganeshi Lal interacted with Panchayati Raj Institution (PRI) members at Jalda here on Wednesday. He also visited Jalda Sevashram and interacted with students and members of women SHGs. Later in the evening, the Governor had discussion with Chief Executive Officer of Rourkela Steel Plant Ashwini Kumar and other officials. He also visited the Goshala at Vedvyas and attended the Agrasen Jayanti function of Marwari community.